Eilonwy attends the weekly party at Riverview. Eilonwy, an Altmer alchemist, is a Conjurer of the Mages Guild who sells magical supplies at the Cheydinhal Guild Hall. She is married to fellow guild member and spell merchant Orintur. After waking up at 6am, she will eat a two-hour breakfast. She will then pass most of her day mixing up potions with her mortar & pestle behind the counter in the guild building's west wing, at times breaking off to have a sip of the restore luck potion. Between 5pm and 8pm she should be following her husband around their spacious home, Willow Bank, but doesn't, due to a bug. Instead, she will freeze in place until 8pm, when she will head upstairs to eat dinner with her fellow guild members for two hours. At 10pm she will head to her bed on the second floor. On a Loredas evening, she will attend the exclusive Riverview parties organized by Voranil. She will eat dinner between 8pm and 10pm and then wander around until midnight, at times conversing with the other party guests. She has 800 gold and a Mercantile skill of 40. She will buy ingredients, potions, alchemical apparatus, and miscellaneous items from you while selling only magical supplies. She will offer her merchant services when not eating, sleeping, or taking her weekly trip to Riverview. She wears upper-class attire consisting of a green brocade doublet, green silk garment, and a pair of green velvet shoes. She also carries her potion, her mortar & pestle, an empty grand soul gem, her key, a sizable amount of gold, and a bread loaf, which she consumes during her meals. She doesn't wield any weapons, relying instead on a set of leveled spells from all of the magical schools. She is very humble, and, in her dialogue, she prefers to praise her husband Orintur rather than herself. For example, in her greeting she will enthusiastically tell you: "I'm Eilonwy. I'm only a conjurer, but Orintur is a full Magician. Isn't he wonderful?" When asked about Cheydinhal she will express her love towards her husband: "Perhaps it seems silly, but our love is the most important thing in all creation. Orintur and I spend all our time together, in the High Elf way." Finally, when asked about the Mages Guild she will comment on her husband's magical ability: "Orintur doesn't like to brag, but no one can match the Reflect spells he can cast. He might teach you one, if you're skilled enough." Being an alchemist by heart, she will be more than interested when you present her with a sample of nirnroot. She will, however, point you towards master alchemist Sinderion: "At the last Imperial Alchemy Symposium, I heard Sinderion mention something about a strange glowing root. I'm afraid I can't remember what he said about them. 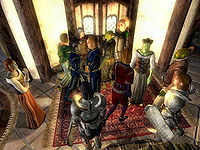 Perhaps you should make the trip to Skingrad and ask him in person." Orintur is just as much in love with Eilonwy as she is with him. He will tell you: "I'm very fond of Cheydinhal. It's where I met my love, Eilonwy. Our lives are quite long, and choosing the right partner is very important." The other folk in town have noticed the two of them together, and will often ask each other "Have you ever seen a couple more in love than Orintur and Eilonwy?" or "Have you seen Orintur and Eilonwy recently? They're always together." When looking to obtain the recommendation Eilonwy will comment: "That would be Falcar's responsibility. Good luck." Once Falcar has given you your task she will comment: "It sure sounds like Falcar has it in for you. What a bizarre thing to ask you to do." When she has heard about the incident with Vidkun she will show sorrow: "I heard what happened to him. I wonder if the Mages Council will do anything?" Her AI package for 5pm (CheydinhalMGElamonweExploreOrintur) may have been intended to make her accompany Orintur in his exploration of Peachtree Island. However, as the package is created as a 'find' package rather than an 'accompany' package, she normally ends up locating Orintur within the Mages Guild, and offering Services there for the packages duration rather than reaching the island. This page was last modified on 20 October 2015, at 05:25.